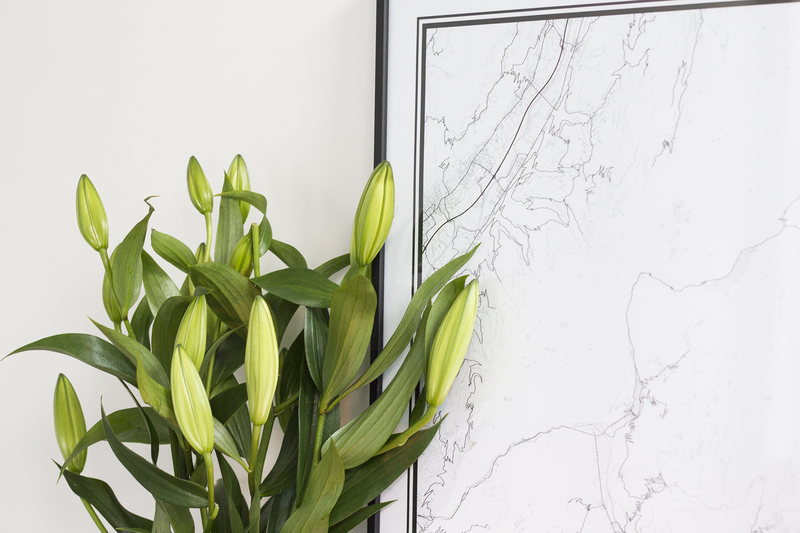 I haven’t shared much from my house renovation on the blog. To be honest, it’s a much slower process than I’d originally thought. The main work is all finished (minus the odd bit of plastering) but decor-wise, we’re still doing things bit by bit. It’s expensive when you move into a new house and you don’t neccessarily have all of the furniture and household items that you need. Sofas, fridge freezers, storage… they all add up quite quickly! We’ve been really lucky to have such a supportive family though and inherited a few furniture pieces that used to belong to Mat’s nana. This sideboard was one of them. Originally a pretty plain pine sideboard with wooden handles, I spent some time cleaning and sanding it so we could upcycle it. 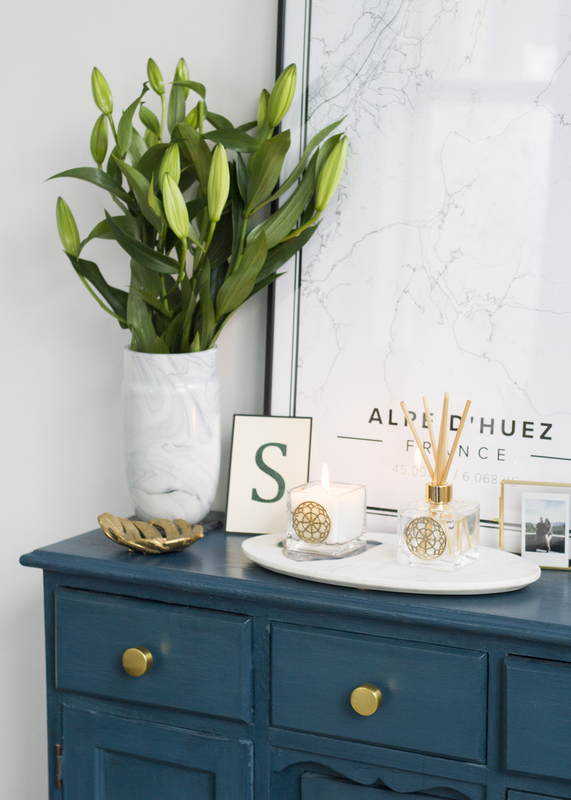 I used Chalk Paint by Annie Sloan in the shade ‘Aubusson Blue’ and added gold handles from Oliver Bonas. I don’t think they sell them anymore, but these are the ones. It’s now one of my favourite pieces in the house (despite its pretty rough finish, oops) and cost us hardly anything to make. Styling it has been quite fun really! When you find a new little trinket to add to it, it’s such a great feeling. One of my first additions was a beautiful marble and agate candle stand, which was a Christmas pressie from Mat’s mum. 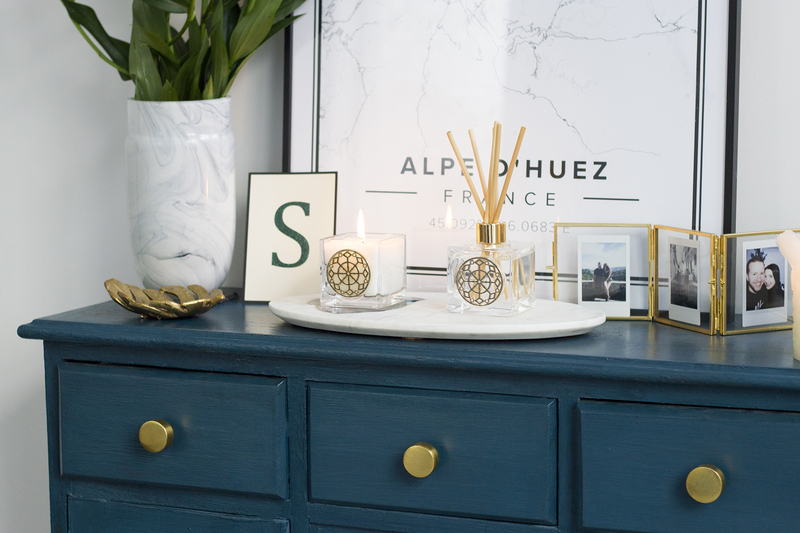 I love that it’s solid marble, matching our coffee table, with stunning blue agate embedded into the left of the stand that also matches the sideboard. 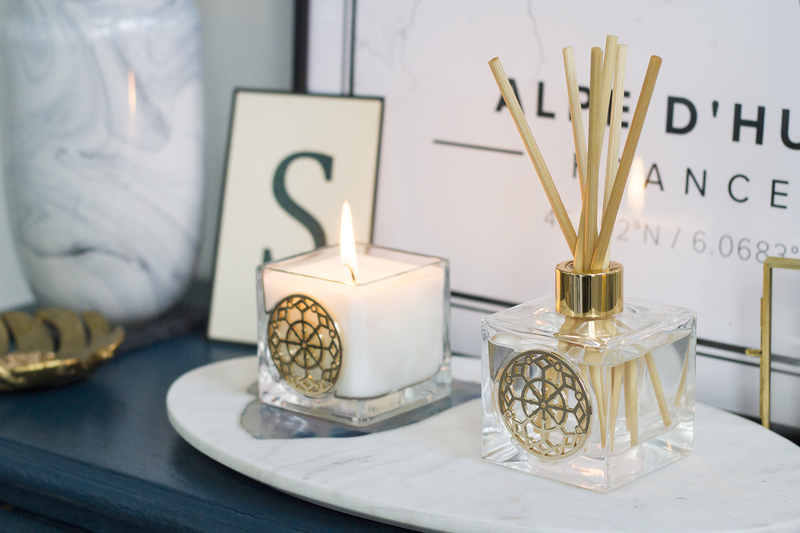 If you haven’t noticed, anything golden is my favourite, so these Amber & Frankincense home fragrances from Monsoon Home are a lovely new addition. I’m obsessed with candles but they’re not always as pretty as this one. It’s described as a “rich, warm, woody fragrance… complemented by the spiciness of the base notes”, which sums it up really well. 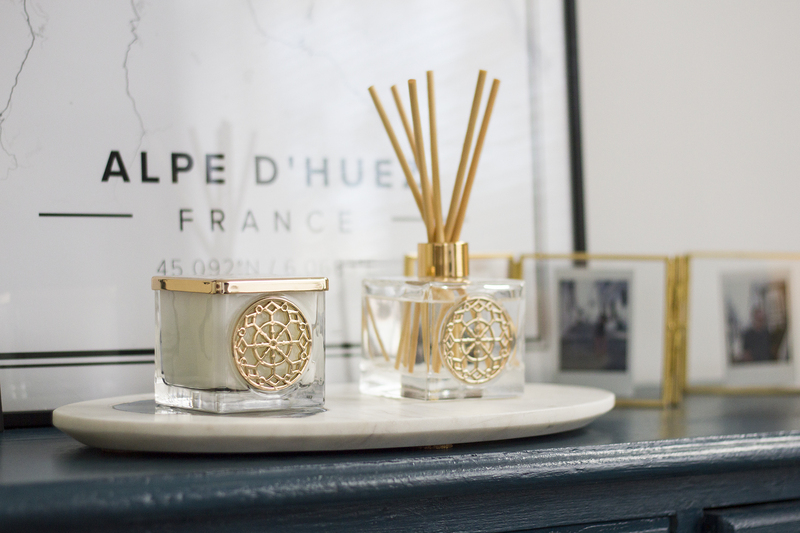 It’s a warming and inviting fragrance to fill your home with. I think the diffuser is out of stock at the moment, but they also do a Bergamot & Fig one, which sounds lovely. 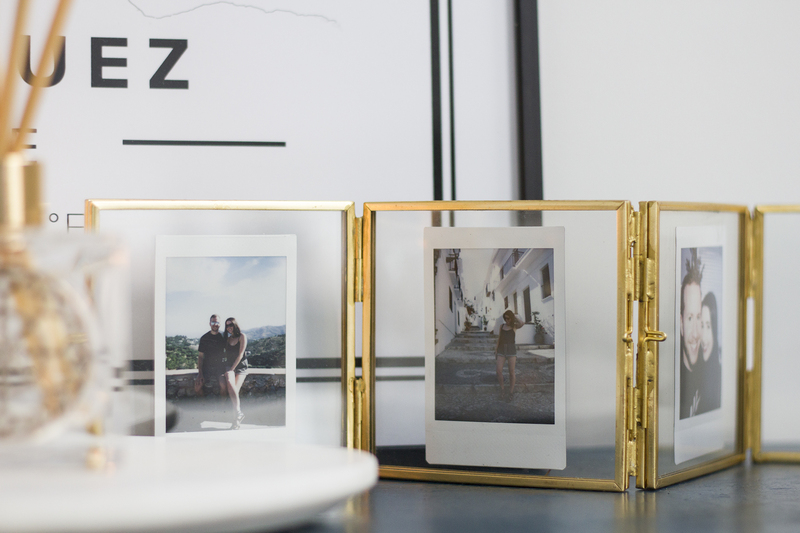 Another favourite piece is the Gold & Glass Mini Square Multi Frame by Oliver Bonas. It’s the perfect size for square Instagram shots, but I love using mine to show off my photos taken on my Instax Mini 70. They float perfectly in the frames! The sideboard is finished off with a rather special piece. This minimalistic map is from Mapiful, where you can create your own map print, customised with any place you want in the world. I chose Alpe D’Huez for ours, as it’s where Mat & I first met. Have a little look for a discount code before you buy though, as there’s always one floating around. Like I said, this is now one of my favourite spots in the house and I can’t wait to start styling up more pieces. Next on my list is my gold bar cart, so stay tuned for a blog post on that! Have you upcycled any furniture pieces recently? I’d love to see your pics/blog posts!